Yesterday, with the help of a much smarter friend, I dug a little bit into the home-run surge that we’ve all observed. There was room for some more examination, though, so this is to be considered a brief follow-up. Toward the end of that post, I engaged in some speculation. Based on evidence below, I believe I was wrong! To re-cover some territory real quick, we do have this fact, established in the original post: Home runs are being bunched unusually tightly. The distribution of home-run rates around the game is closer to being even than ever before in at least the game’s modern version. That’s interesting! More and more hitters are getting into the dinger spirit, such that the landscape isn’t so dominated by a handful of elites. That now being given, let’s move on. I speculated in the post that the relative rise of the middle class could be an argument against the different-baseball theory. There’s a very compelling and convincing line of thought that the baseball has changed, leading to more homers, but I guessed that any such change would affect all hitters equally. That’s not what the data seemed to show. Now I want to argue against myself. For this research, I made use of Baseball Savant, which provides all that beautiful Statcast data. I wanted to compare 2016 to 2015, so I grabbed all the player-seasons with at least 200 plate appearances, and this time for each of them I calculated home-run rate per fly ball or line drive. In the post yesterday, I calculated home-run rate per batted ball, which is a little different. Once I had all the rates, I divided them into quartiles again, in order of power output. 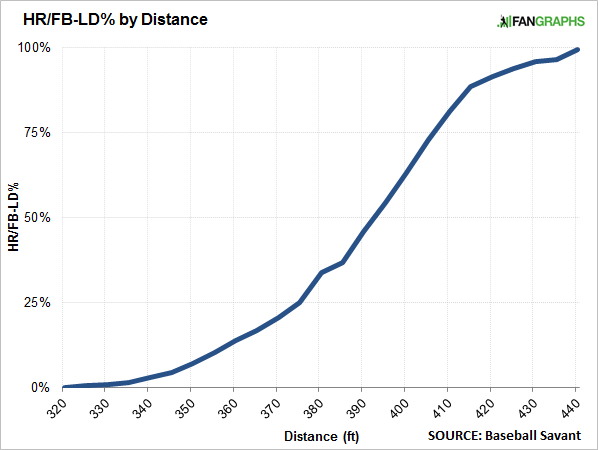 Then, from Baseball Savant, I pulled a bunch of average fly ball/line drive distances. I understand that using the average isn’t the absolute best way to go about this, but it should do most of the job. This is why I think I was wrong. That top quartile is showing a boost, here. Every quartile shows some kind of increased distance. Now, I get that Stacast hasn’t captured every ball in play. That’s a potential source of error. But if we take this for what it is, there’s an increase across the board, that increase most favoring hitters who should want balls in the air. This is what we would expect if the ball were changed. Everyone gets to hit the ball a little farther. I think that pulls the rug out from under what I speculated. You see an increase in the most powerful quartile, but you see an identical increase in Quartile 3. Further, you see a similar increase in Quartile 2. Quartile 1 hasn’t budged much. 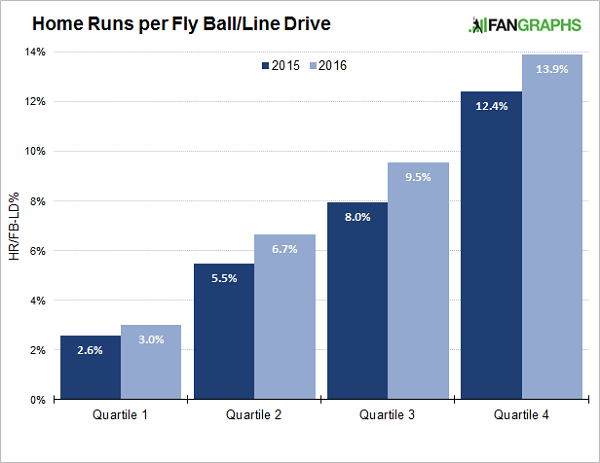 The batters in Quartile 4 have increased their average distance by almost five feet. The batters in Quartile 3 have increased their average distance by three feet. 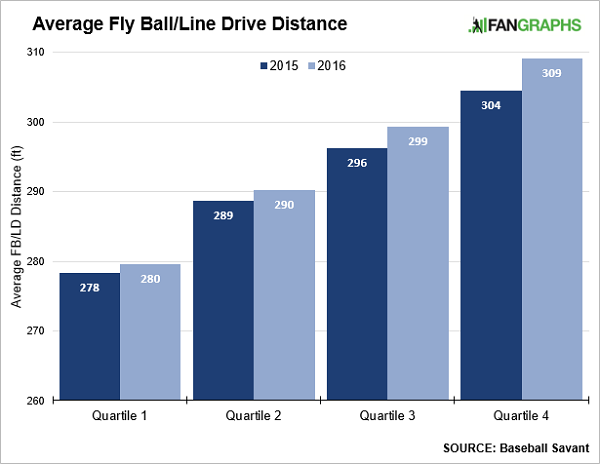 The batters in Quartile 2 have increased their average distance by less than two feet. A few of you got this right away, in the comments and on Twitter. And it seems to be true: The strongest hitters just don’t stand to benefit so much from a distance increase, because they would hit relatively few “almost-homers.” The weakest hitters also wouldn’t benefit too much, because they would seldom challenge the warning track. But those guys with warning-track power would benefit the most, because then it’s just a matter of a few feet turning an out into a dinger. It’s not a straight line, and it steepens around 380 feet, before flattening out again around 420 feet. Any movement for a player around the middle could be hugely important. Around either end, it wouldn’t matter so much. This all feels like something very obvious, but it’s good to have evidence, even if it could stand to be more robust. I’ll leave further research to other people who are better at this than I am. They number in the, I don’t know, thousands?, but even with where we are today, it’s of interest to go over a couple implications. For one thing, we still can’t disprove the idea that the baseball has physically changed. They keep saying that it hasn’t, and I even want to believe them, but there’s just no other reasonable explanation I can think of for what’s been happening league-wide. I thought I might’ve been able to make one point, but then I went and argued against myself, and I’m mentally back where I started. The baseball is flying, for all hitters. The weaker ones and the stronger ones. I would really, really love to know why. And for another thing, because the baseball is flying, that seems to have most strongly benefited the middle class of would-be power hitters. Those are the hitters for whom a few extra feet of distance would have the greatest marginal value. More distance helps every hitter, but it doesn’t help them all the same. So teams might be unsure how to proceed. Should they invest in average power, or not? Will this end up a mirage, or should roster-building start to favor the warning-track types, since they’re suddenly becoming second-row types? It’s almost impossible to know what to do without knowing the reasons behind the homer surge in the first place. That’s one of the reasons this is such a big deal for everyone. We hoped you liked reading Home Runs and the Middle Class by Jeff Sullivan! Thanks for this article. Mentioning a “juiced ball” regularly gets you downvoted to all hell on here but to me it has seemed like the most logical explanation for awhile now. Agreed. I think the game has been changing for the last decade or so, but for it to just “click” for such a large group of guys in the same year seems extremely unlikely. Something else has to be going on. Couldn’t it be that the physics of hitting a ball are more accessible than ever before and hitters are adjusting their swings to maximize their exit velocities and launch angles? So over the span of one year, players have universally used this data and successfully changed their swings?